In comparison tests with other methods of corrosion protection, Intercept Shield  is clearly the most effective of all those available today. 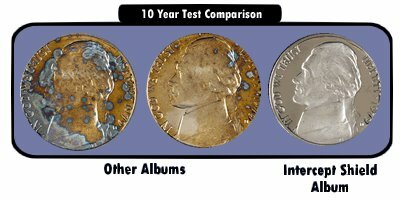 Lucent Technologies tested three different coin albums the results of which, are shown below. This remarkable technology provides 10 years of corrosion protection for each thousandth of an inch thickness, under normally encountered corrosive conditions. To get Intercept Shield  products, go to your local coin dealer. Intercept Technology ® is a Lucent Technologies patented and licensed polymer process. The Technology has been licensed, manufactured, distributed, and sold by our licensees since 1991. In order to ensure the highest quality production, and manufacture of Intercept products are maintained, samples of production materials are regularly retained and tested. These checks, coupled with periodic inspections and updated improvements in formulations create a technically advanced product. Periodically, final products are laboratory tested for static and/or corrosion protection performance. Coin storage systems are designed to protect copper, silver and their alloys from tarnishing. These metals are commonplace in the electronic equipment Lucent Technologies manufactures. Therefore, it is beneficial for Lucent Technologies Bell Labs to test their performance of such systems so as to expand our information base in the matter of the atmospheric corrosion protection of electronic materials. This report describes such a test for corrosion protection and its results. Storage systems for coinage have been tested for corrosion protection from atmospheric trace sulfur gases. Intercept Technology significantly outperformed non-Intercept Technology systems. Typically, experiments used to mimic these natural occurring processes utilize water and a corrosive gas. We have chosen this proven method to evaluate product performance. The gas we wish to use as a catalyst for the test is hydrogen sulfide. It is abundant in the atmosphere. It has a natural vapor pressure of 292 psi at STP, is colorless, and it has an affinity for reacting with copper having a chemical stoichiometry favoring a Cu reaction as does carbonyl sulfide and three to four times more than So2. Intercept Album, multipage book with clear plastic covered slot and an outer cover with Intercept Technology throughout the book. The populated books were placed in the test chamber for a 150ppm hour exposure. Previous work indicated this exposure is equivalent to average ambient H2S exposure for 10 years. The evaluation of Intercept Technology ® encompassed equivalent 10 year sulfurous atmospheric trace gas corrosion testing followed by optical evaluation, scanning electron microscopy, and x-ray elemental analysis. This generic testing and evaluation was designed to demonstrate the protection ability of material packages in reference to corrosive atmospheric sulfur trace gases and their reactions with copper, silver, and their alloys. The test results show the tested Intercept Shield  products offer a considerable increase over other non-Intercept protective products.